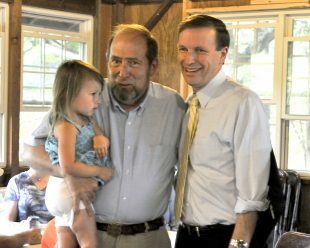 The record high temperature of 96 degrees didn’t deter nearly 100 friends and family from attending the Suffield Democratic Town Committee picnic on July 28th. The picnic was held at Sunrise Park in West Suffield where long-time DTC member John G. Smith IV was honored as the Democrat of the Year. US Senator Chris Murphy thanked John Smith for his volunteer effort in town, and then spoke of his own speech at the previous night’s Democratic Convention in Philadelphia. Suffield First Selectman Melissa Mack started the Democrat of the Year festivities with thanks to John for his volunteer efforts on town boards and commissions and as a volunteer firefighter. Janet Banks then spoke about John Smith’s work as a minister and counselor, and his impact on the Friends of the Farm at Hilltop non-profit group who is managing the restoration of the large barn and associated outbuildings. Tom Romano detailed John’s long service as a fire department volunteer, while Eileen Moncrief wrapped it up by covering his activities on the Zoning and Planning Commission and Board of Selectmen. John Smith thanked the group for the warm feelings and good company, and for the rest of the evening people turned to good conversation and discussions about all that goes on in Suffield.